Sewing machines generously provided by Baby Lock. 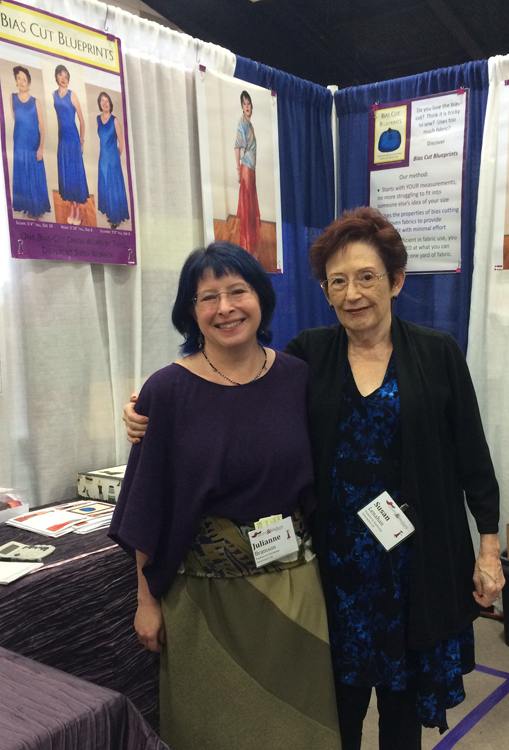 Julianne and Susan had a great time at the biggest sewing party in the US! The Sewing & Stitchery Expo in Puyallup, Washington. Future Class in Your Area? Susan and Julianne love to travel and to teach. We can bring our classes, trunk show, and pattern store to your location. Phone or email if you are interested in hosting us at your location. Be your own designer! Make a fun and flattering bias skirt with a method so quick and efficient, you will be amazed! You won't need a pattern to make this great wardrobe basic! Join designers Julianne and Susan as you learn how to fold and sew a skirt that is flattering for all sizes. Lots of variations are possible for a whole wardrobe of great skirts. Designers Susan and Julianne will show you lots of ways to change the look of a simple bias skirt. Learn how to make it flared with large inserts, how to piece the fabric on the straight of grain to get wonderful diagonal piecing in your skirt, and how to incorporate a pretty piece of precious fabric or a scarf to give the skirt a whole new look. Expand your creative skills while expanding your wardrobe! Make an elegant and flattering bias blouse with a method so quick and efficient, you will be amazed! You won't need a pattern to make this great wardrobe basic! Julianne and Susan have done the math and perfected the technique to fold and sew a blouse that is flattering for all sizes. Neckline and sleeve variations produce a room full of great blouses. Be your own designer and embrace pattern-free sewing! Be your own designer! Make a flirty, perfect for dancing, flattering, flared bias skirt. This method is so quick and efficient, you will be amazed! Join designers Julianne and Susan as you learn how to fold and sew a skirt that is flattering for all sizes. Several variations are possible for a range of flair and hem circumference. Embrace pattern-free sewing! A quick and easy method that uses only a half yard of delicious fabric and becomes a simple and elegant bias cowl scarf. Great for project leftovers and to make matching accessories! This class is a fun introduction to the Fashion in Harmony method of creating bias cut garments. A rectangle of fabric becomes a beautiful cowl scarf with just 2 seams! Piece 2-3 fabrics together for a scarf with multiple looks. Soon, you will be making them for all your friends! 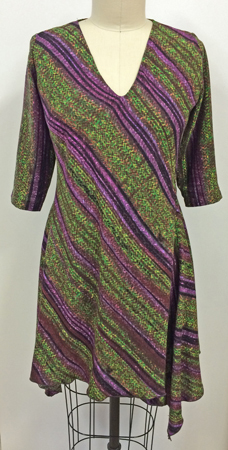 Your beautiful bias blouse or dress deserves neckline and armhole finishes that complement the garment. Traditional facings are not appropriate for bias garments, as they inhibit the fluidity and drape so loved with the bias cut. As the designers for Fashion in Harmony, a pattern company specializing in the bias cut, Julianne and Susan are experts at finishing bias garments. Learn her favorite ways to elegantly finish bias necklines and hems. Students will make samples of each finishing technique and take home a detailed handout. The secret of famous fashion designers and well dressed Hollywood starlets is the amazing bias cut. Turning the grain on your patterns 45 degrees will give you a dress, blouse, skirt, or jacket that comfortably and attractively flows around the feminine lines of the body. Learn how to use the bias cut and how it can be flattering for all sizes, ages, and body types! Fabrics for Bias Cut Garments - Combines well with "The Magic of Bias"
This class will teach you how to choose the right types of woven fabrics to use when sewing a bias dress, blouse, or skirt. Learn how to determine the right weave, hand, and weight of fabric for the a flattering garment. Designers, Julianne and Susan, of Fashion in Harmony Patterns will show you which fabrics work the best for bias designs. Learn how to pre-treat fabrics for bias to reduce their tendency to stretch out of shape over time. What fabric do I use? If you ask this question often, this lecture is for you! It will help you to understand how to identify fibers (look, feel, and burn test), what their physical properties are, and how to choose the best fabric for your project. Cotton, Wool, Silk, Rayon, Linen, Polyester and blends, as well as some of the new eco-fabrics will be covered. Students will create a binder with samples for reference. Bring Notepaper and a ½” to 1” 3-Ring Binder.